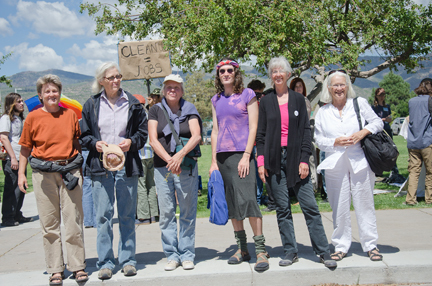 The trial of the LANL 6 yesterday was an amazing and profound, as well as sobering, occasion. More than 70 supporters and friends turned out to accompany the 6 and their legal team of Jeff Haas and Lisa Krooth, into the court and to witness proceedings. Court officials said they had never seen such a large audience for a trial, and indeed the court could only contain 53 people in the audience at any one time. Thank you to all of you who gave your time to be present yesterday. We know that it meant a huge amount to each of the 6 who were on trial. Unhappily, the judge was unmoved by these arguments. He found all 6 not guilty of trespass, but convicted them on the counts of obstructing movement and refusing to obey a police officer. The prosecution did not call for jail time, and so the judge fined each of the 6 $100 on each count, plus court costs, and put them on probation for one year, with a condition that they not be arrested in Los Alamos County during that year. While the fines are significantly less than those that could have been imposed, the one-year probation is excessive in a case like this. However, all of the LANL 6 stand in solidity and are refusing to pay the fines, on the grounds that they have committed no crime and indeed were working to prevent much greater crimes. They now have 15 days in which to decide whether to appeal the court’s decision, or to try an alternative route. If they do not pay the fines within 30 days, they face jail time. We will keep you updated on the progress and decisions the LANL 6 and their defense team make over the next few days and weeks. In the meantime, we are already starting to organize for 2013, including of course events and protests in July and August – July 16th being Trinity Day, August 6th Hiroshima Day, and August 9th Nagasaki Day. Thank you for all that you do to help make our society more peaceful and sustainable.